These beautiful darlings are sold in pale blue foil bags. 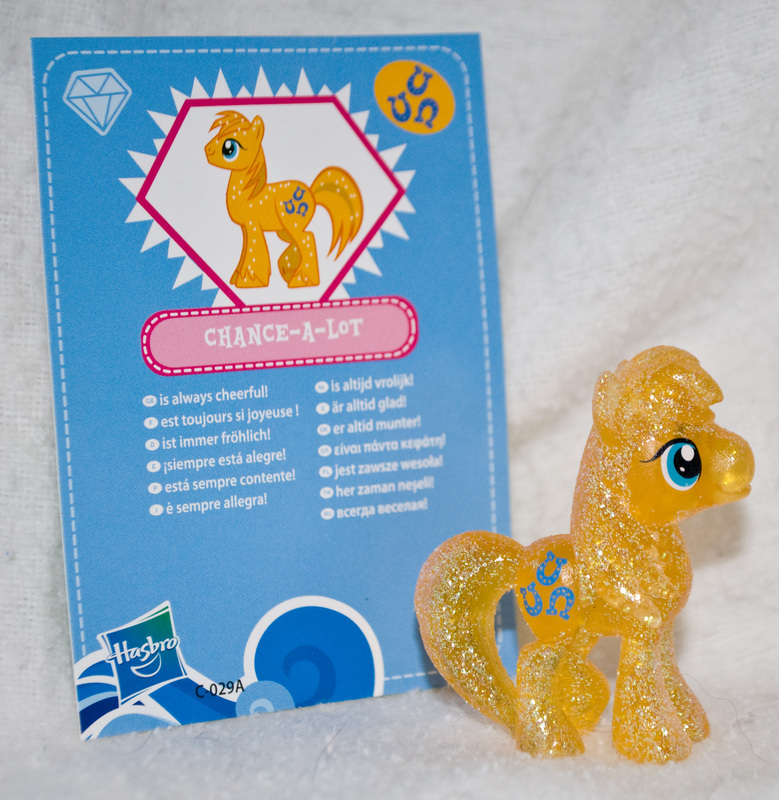 Almost all these ponies are translucent plastic with glitter. They're fantastic for display, and include a host of new friends. 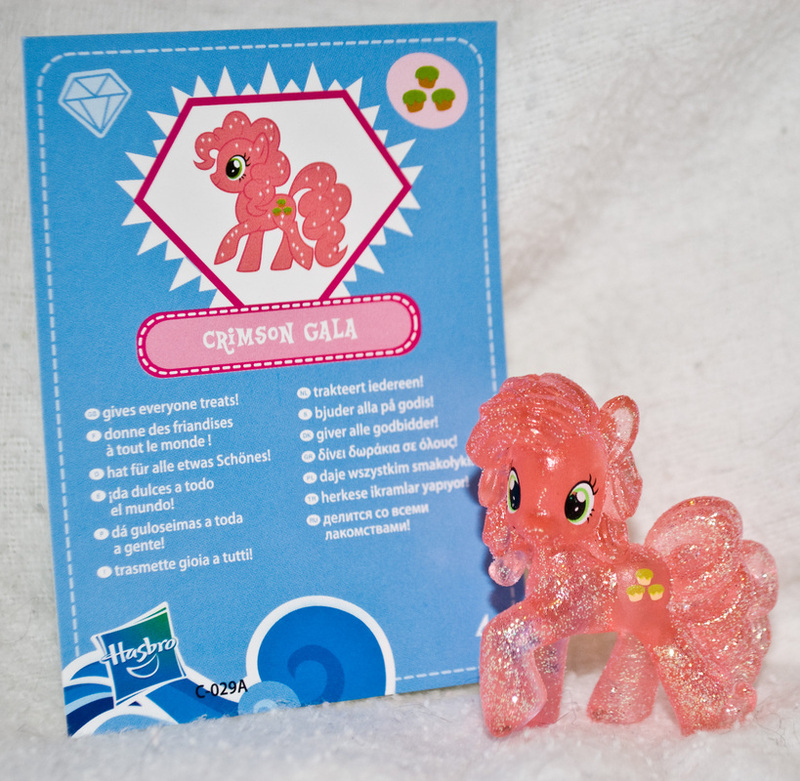 This set also includes the rare Metallic colored Rarity(silver) Applejack (Gold) and Pinkie Pie (metallic pink). 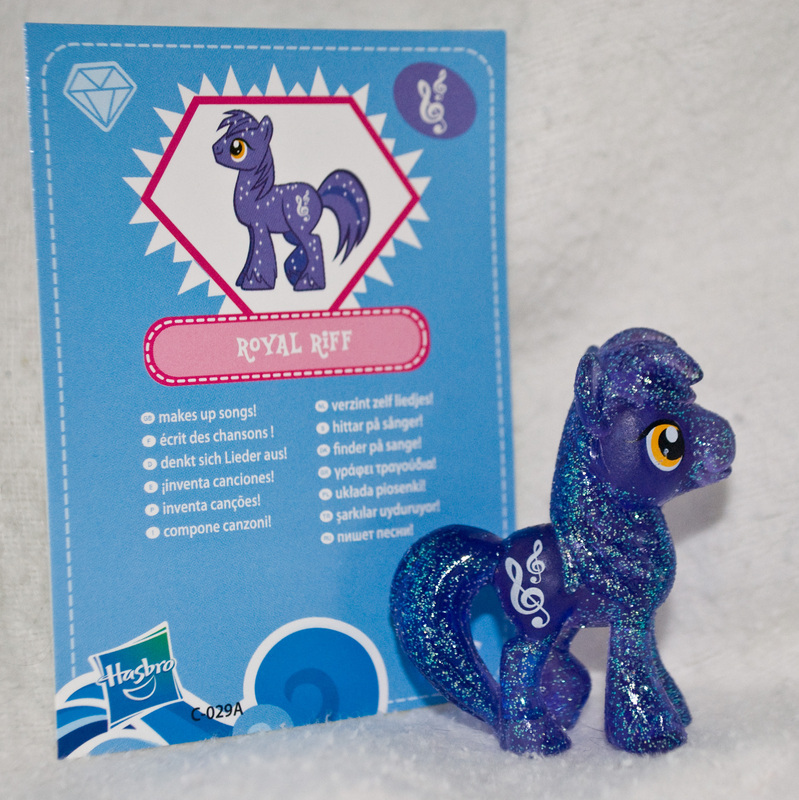 This group also features 4 RARE Glitter Colts, and new versions of the Glittery Mane six, released with color differences making them distinct from the Wave 1 and Wave 2 sparkle ponies. 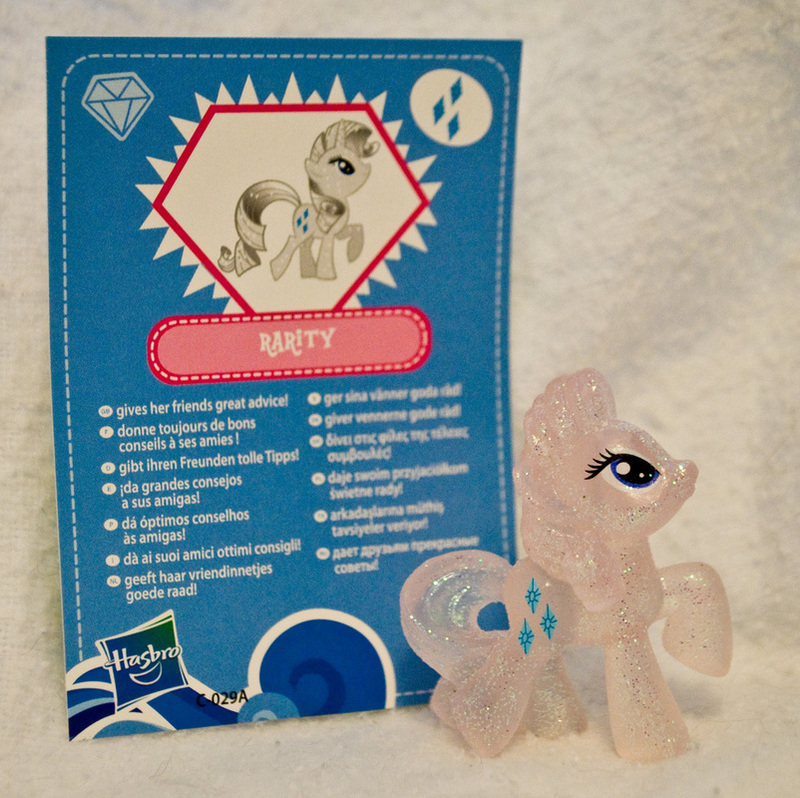 Glitter Version 2! 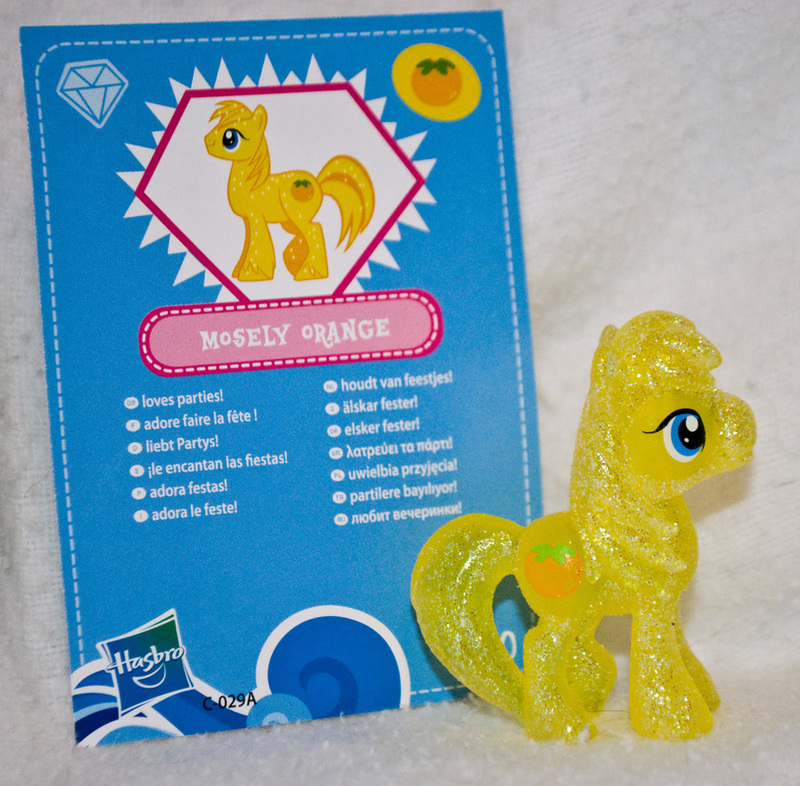 Less orange and more yellow! I actually prefer this one. 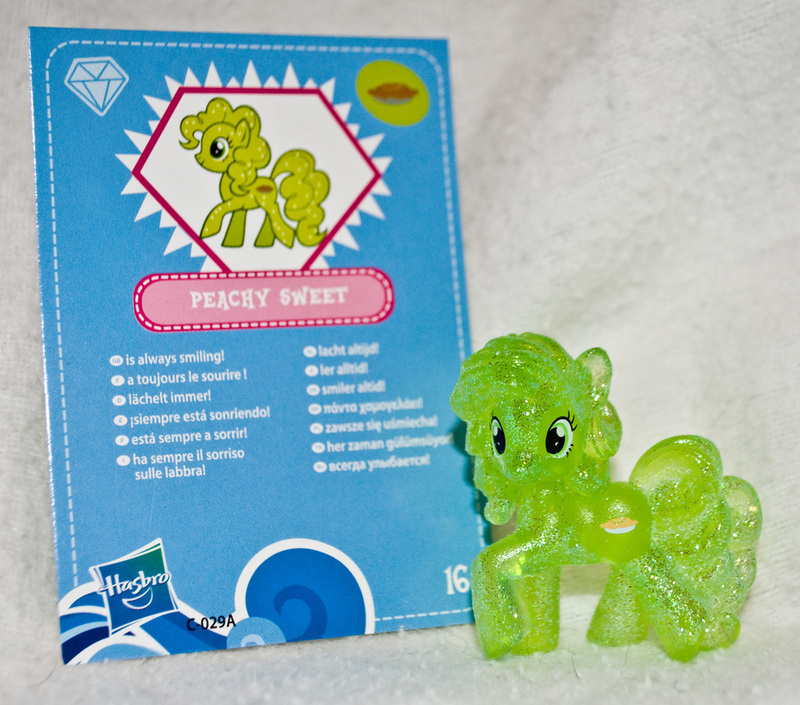 Wave 4 Fluttershy is VERY similar to Wave 2 Glitter Fluttershy, but she's a slightly more frosted neon yellow, whereas W2 Fluttershy was more of a clear true yellow. 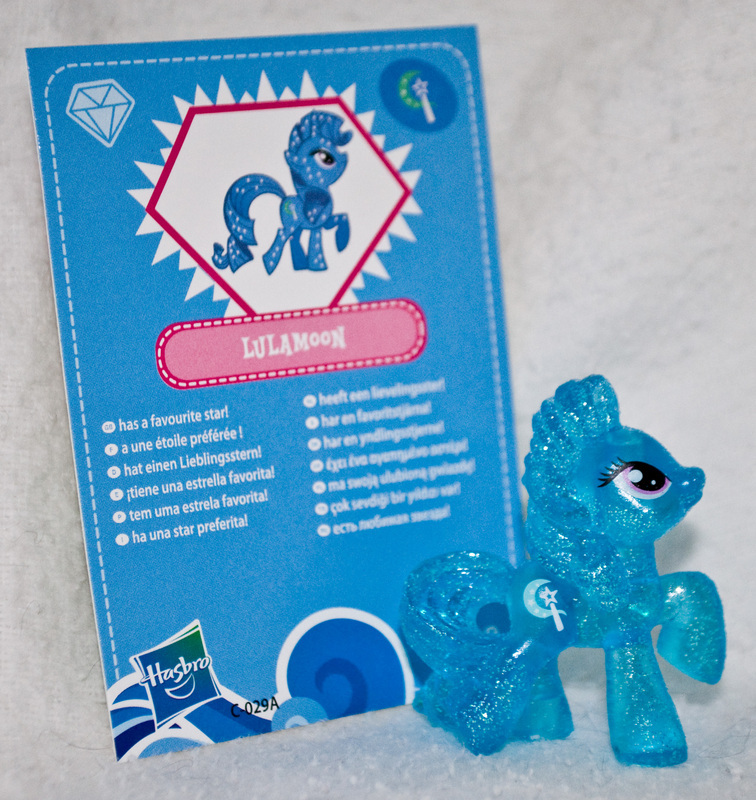 This pony is sold as 'Lulamoon' but her cutiemark and color matches that of 'The Great and Powerful Trixie' from the TV show. 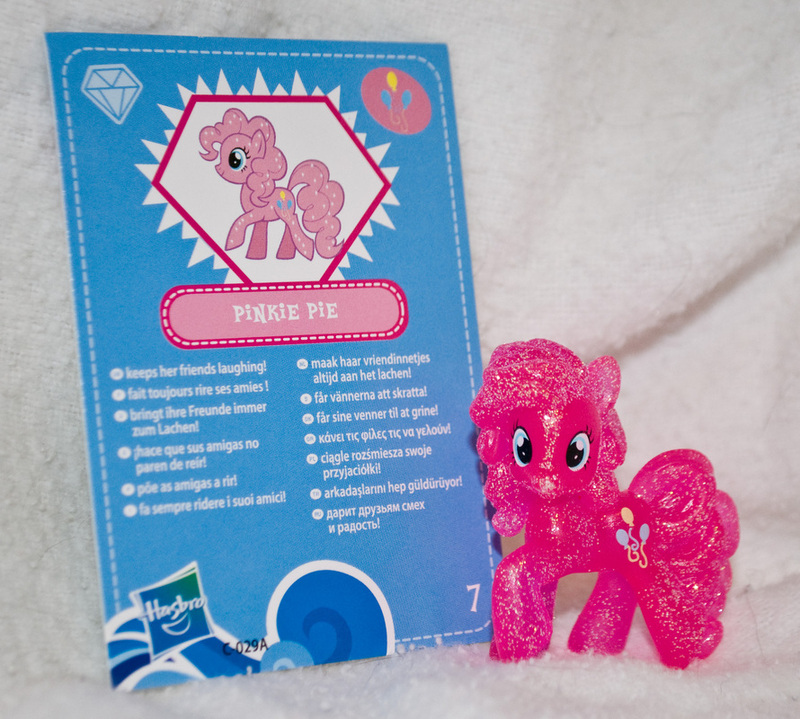 In later releases the toy is named 'Trixie Lulamoon' giving her a last name to avoid confusion. 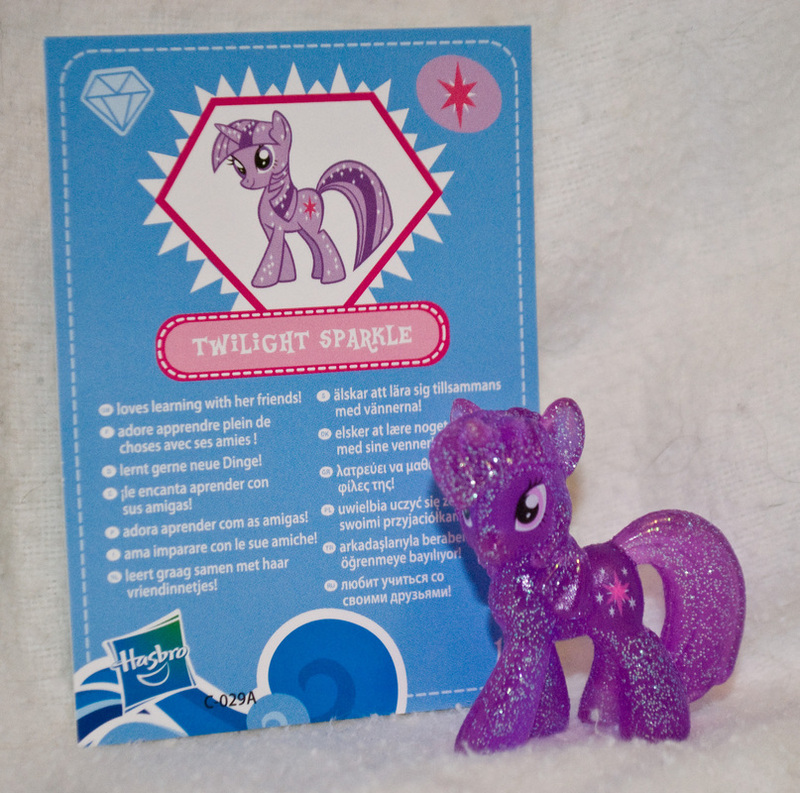 Sparkle Version 2! 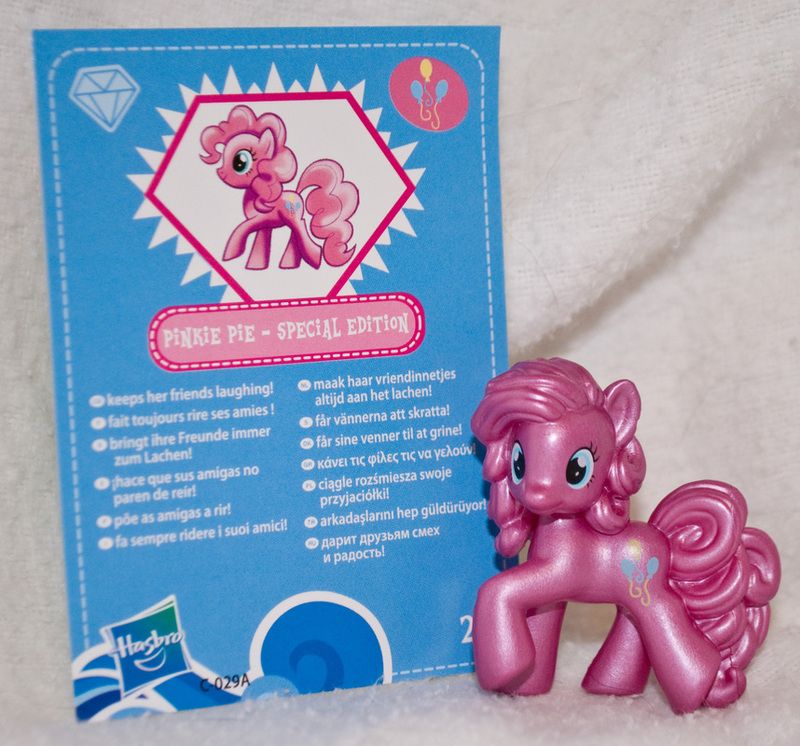 This version is a MUCH darker pink, hardly even recognizable as Pinkie Pie, but they didn't change the cutiemark! V2 Glitter Dash! I love this version of the TV shows favorite show stopper. 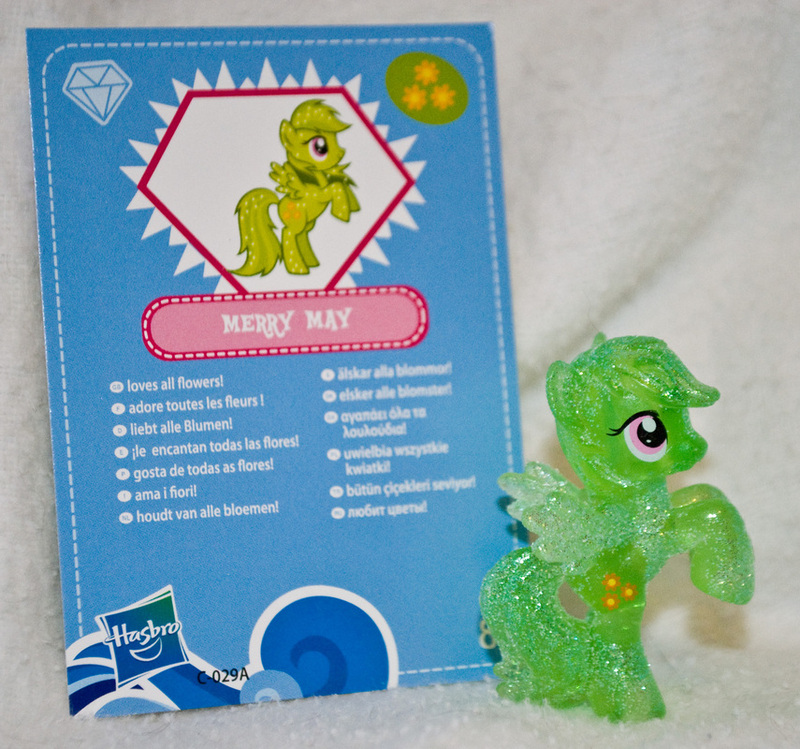 The First glitter version (wave1) was too greenish for my tastes. 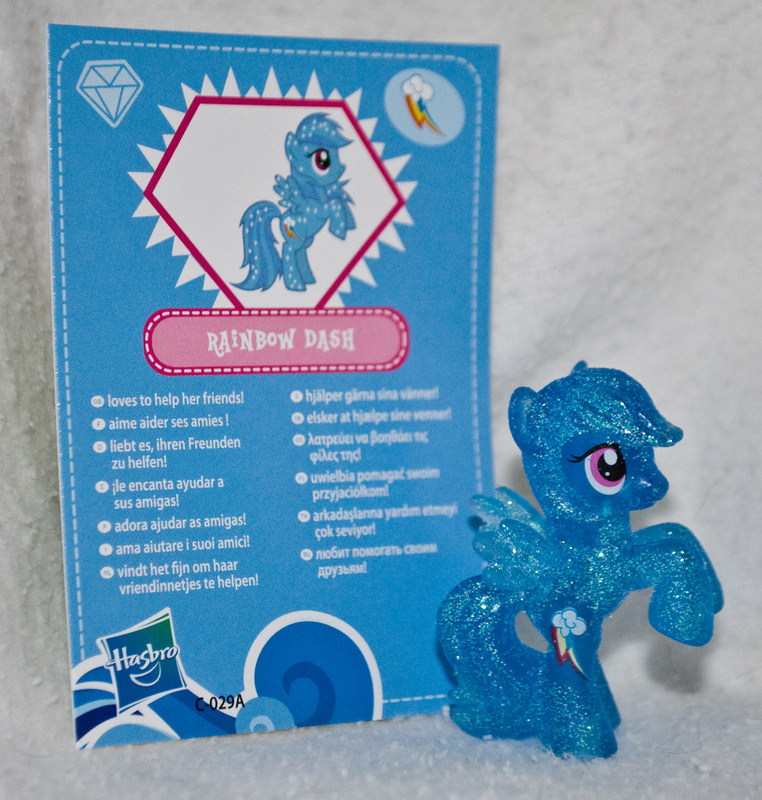 This blue fits Dash to a tee! 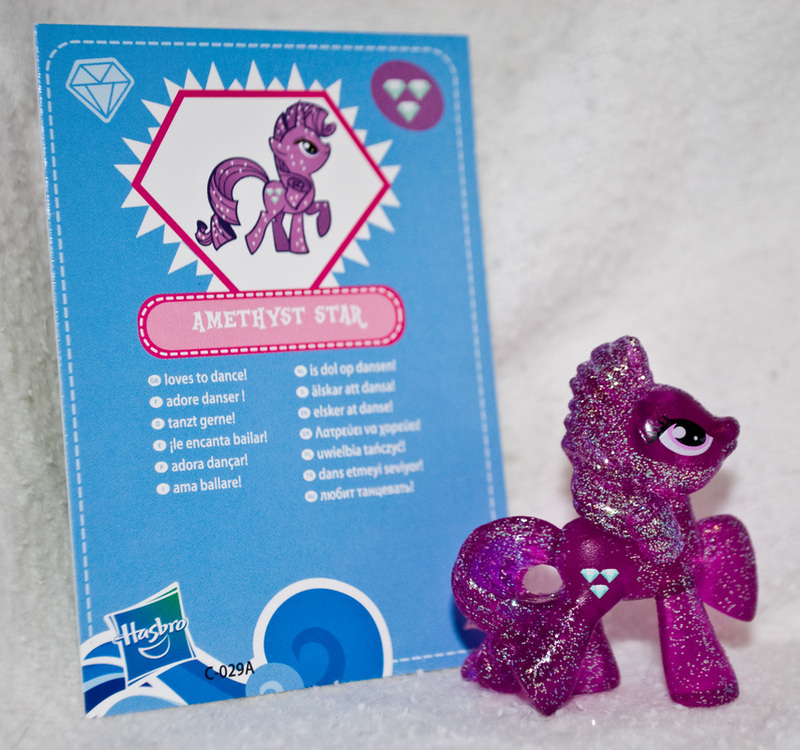 Version 2 Glitter Rarity! 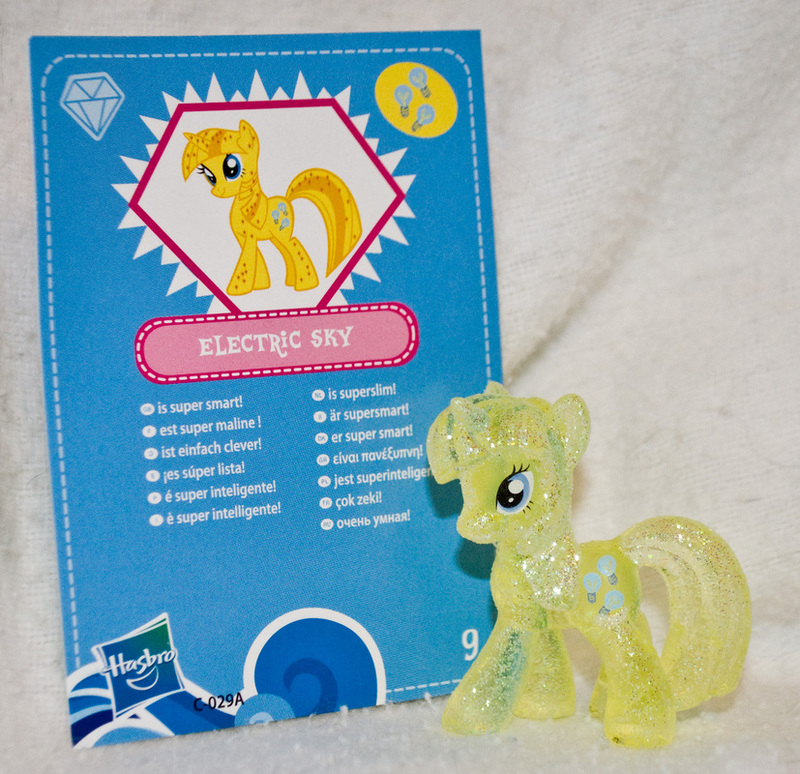 This one is very similar to the second wave Glitter Rarity, BUT a fan noticed several differences so I looked closer, This Rarity actually has more of a frosted glass look to her, with a faint pinkish hue, while Wave 2 is much more clear. 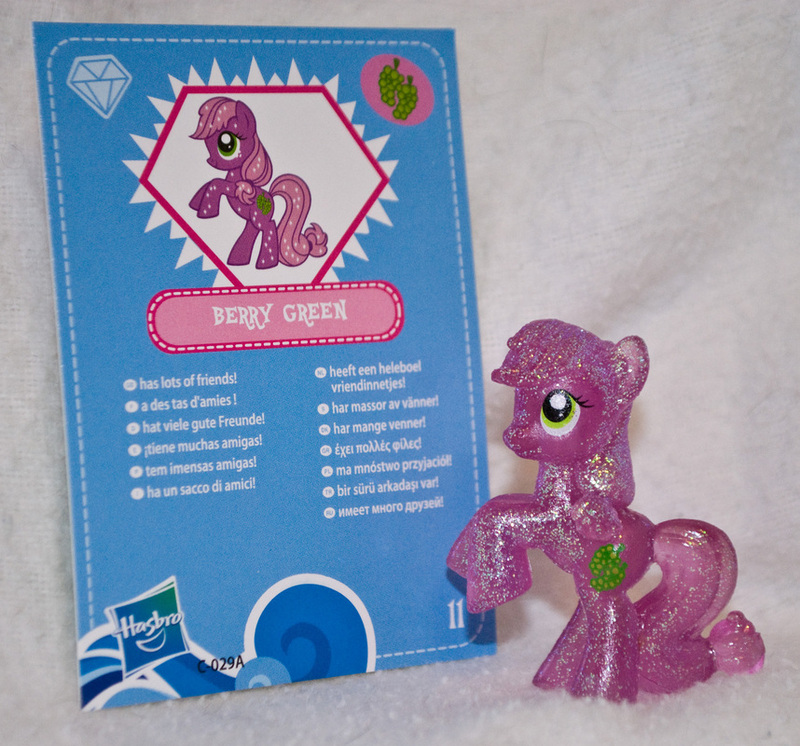 Gorgeous special edition Rarity! 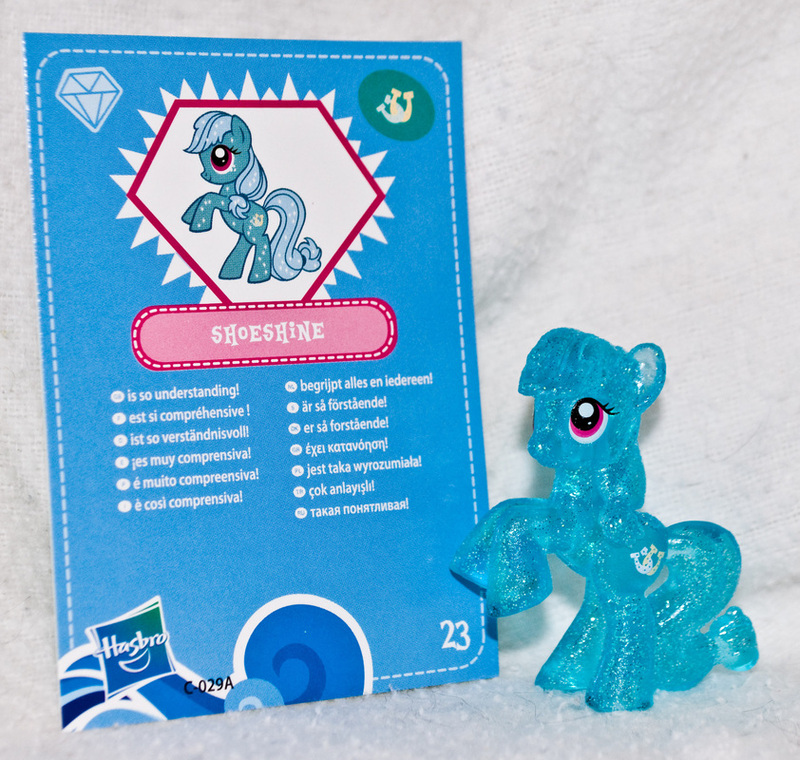 (Mine has a faint line down her face, but I'm sure that won't be true for every Rarity.) 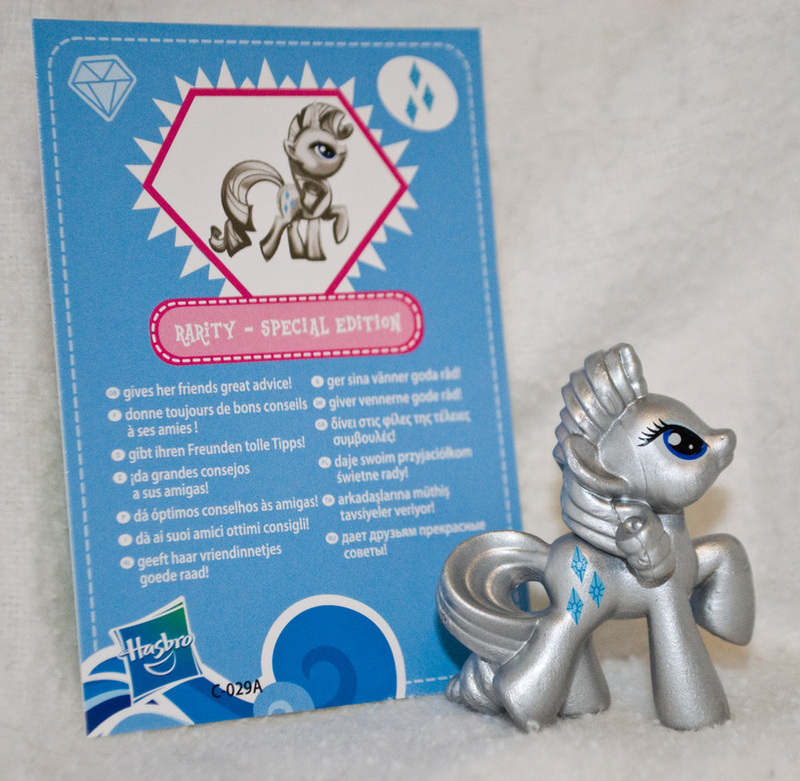 Rarity makes the Metallic Silver look good! 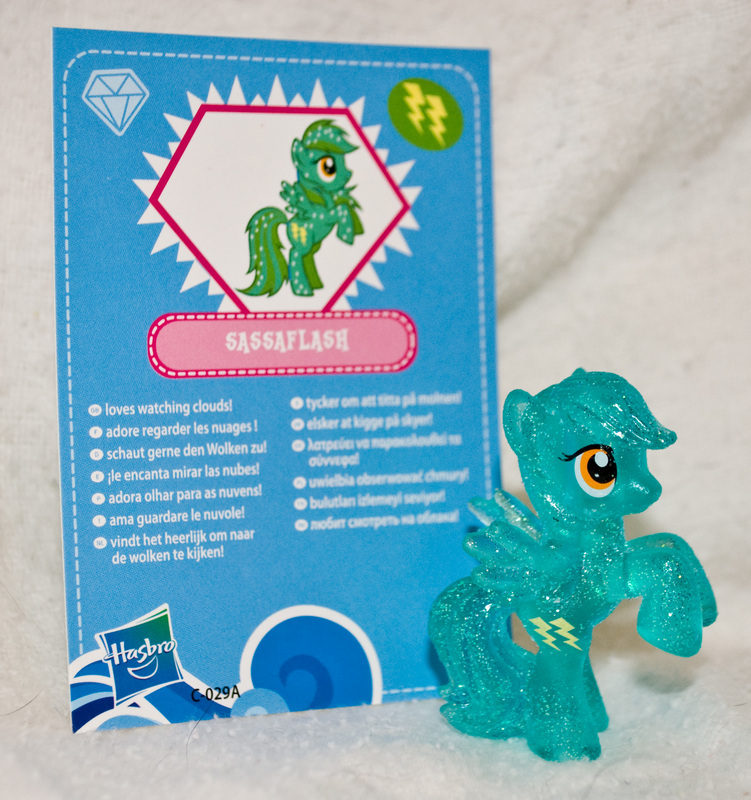 This is probably the best colt for me. 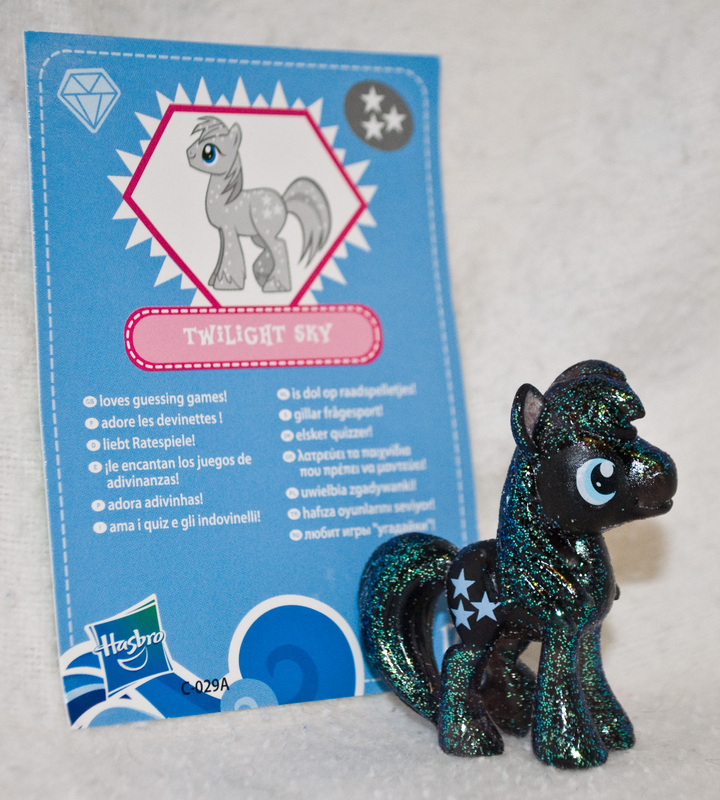 A black COLT! I love him! 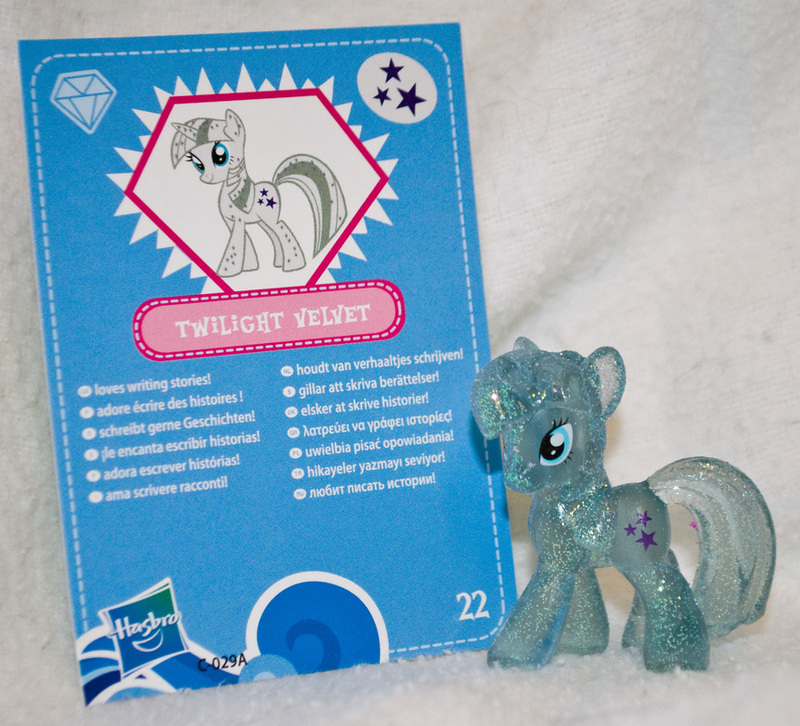 This Glitter Twilight is identical to the ones released in Wave1. I was hoping they'd tried something new with her, but the two I have are identical. Maybe she's a relative of Twilight Sparkle somewhere in Ponyville, but even if she isn't, this is another one of my favorites. 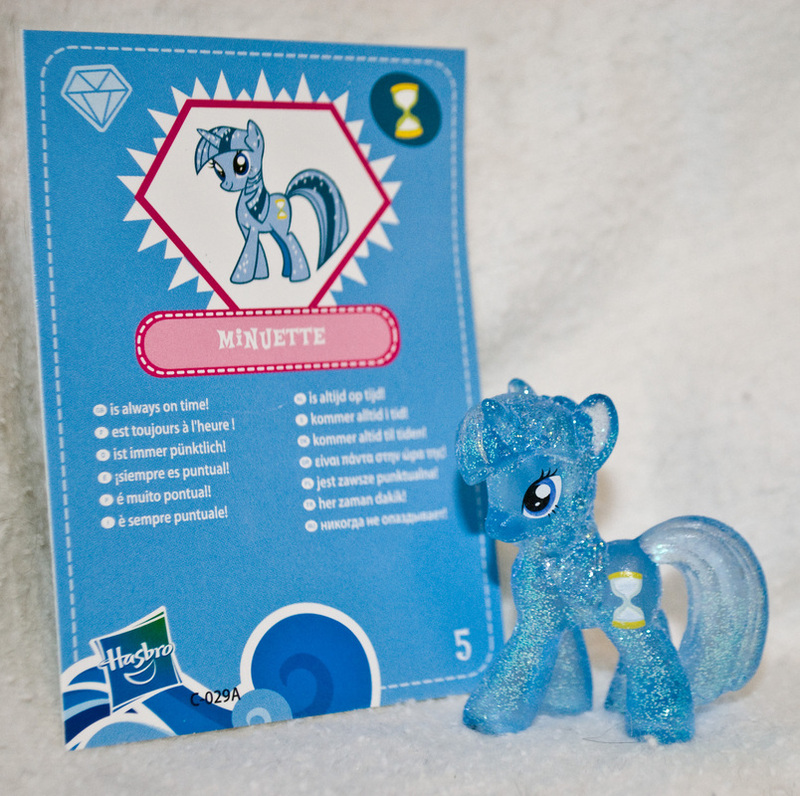 The steel blue is a departure from happy pastels, and I really love this pony for it.